The truth about pools is that they cannot always be kept free of algae and crystal clear with slow, little addition of chemicals. And this includes hot tubs and spas too. Steady and slow might have won the race for the tortoise against the hare, but this isn’t going to happen for algae. Algae and bacteria spores have built-in exponential spread rate. Once they hit your pool beyond a certain level, you will certainly have a hard time trying to control them. The best way to prevent this from happening is to use the best pool shock to shock your pool regularly. So how do you ensure you buy the best brand? Here is a guide to help you out. There are a lot of shocks on the market today but none compares to the following seven models. This is one of the most powerful pool shocks on the shelves today and comes with a lot of extras. Instead of being placed in a bag, the shock comes in a simple to open and pour bottle that is easy to use than a bag (that requires tearing and then trying to pour the liquid out into a container). Another feature of this product is the crystals that kill all blue algae in your pool and they also happen to destroy mustard algae, black algae, and green algae. Furthermore, the shock helps to thwart the growth of the above algae in your facility. These 12 pounds of pool shocks make your swimming pool to appear clearer and safe to swim in. And it works without destroying your pool’s liner, making it a great product for vinyl liner. With the Aqua Chem, you are assured of getting a fast swimming pool shock product that will destroy all algae in your pool. It is a convenience product that you will have an easy time when using it. The shock destroys algae and bacterial effectively, leaving your pool safe and more hygienic to swim in. Furthermore, it makes your swimming pool sparkling clean and it doesn’t affect the pH level. Another great thing about this shock is that you can use it for all kinds of pool and it will help to reduce eye irritation and chlorine odor. It is an optimal product for shocking your swimming pool. In fact, when you add the shock in your pool, you can soon jump into your swimming pool – just wait for 15 minutes and you will be good to go. This product has the active element Potassium Mono Persulfate that comprises almost half of the shock. And it comes inside 24 x 1 pound bags that make it one of the most affordable products on the market today. This shock eliminates the development of algae as well as other dangerous bacteria in your swimming pool. Furthermore, it works pretty well in a facility that is sanitized with the best bromine in the industry. 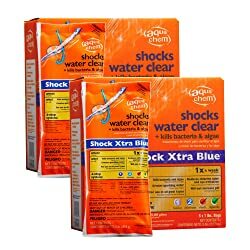 In The Swim Shock burns away all the dead chlorine cells to provide a higher chlorine-free reading. Due to this ability, you can always use the shock to maintain your swimming pool. Also, you can use it to enhance the health of your pool. Although it might seem a bit costlier than other shocks we have reviewed, it is worth every penny. The Pool Essentials 25506ESS Shock Treatment is a fast-dissolving, easy to use shock. It clear cloudy water to leave your pool crystal clear and friendly to swim in any time you want. Also, this product reduces the smell of chlorine, making your pool to smell fresh. Also, the shock is ideal for all types of pools. Actually, it is an ergonomic product that you can use for your in-ground and above ground pool. You should use this product at least once per week to ensure that all algae and bacteria are destroyed and prevent cloudy water. The product was designed for simpler application via the skimmer or you can simply add it to the deep end of your pool. Moreover, you can use it any time of the season and still get the perfect results that you have always wanted. 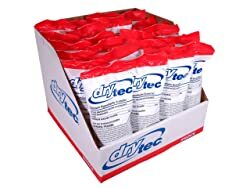 DryTec Calcium Hypochlorite Chlorinating Shock Treatment comes in 24 bags that weighs a pound each. It is a fast-acting product with quick-dissolving ability to leave your swimming pool sanitizer around the clock. The product is quite effective and kills all bacteria, algae, and other organic elements in your pools. It is also able to prevent the development of these nuisances to ensure that you get a healthy pool to swim in. 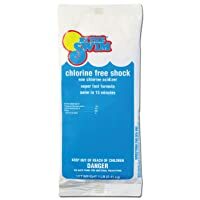 This shock contains 68% calcium hypochlorite that makes it ideal for use as a pool shock. And you can use it in any type of swimming pool. For the best results, use one bag for every 10K gallons of water. The product is not only effective but also economical. Actually, it will save you money in the long run since you don’t need to keep on visiting the market to get other bags every week or so. 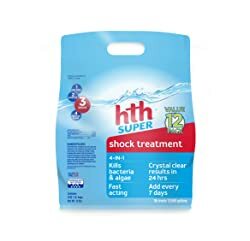 If you are searching for a shock that will kill and prevent algae from developing in your swimming pool, then you should try the HTH Pool Shock Super Shock Treatment. This product not only kills algae but also bacteria that might have contaminated your facility. One great thing about this shock is that you don’t need to add it every day to ensure that your pool is clean. Simply add after 7 days and your facility will be free of these contaminants and other organisms. The product is a fast-acting 4-in-1 shock product that provides crystal clean outcomes within 24 hours. Moreover, you can use the shock in salt water swimming pools and still get the desired results. Just like most products on this list, this shock is very affordable and you can add it to the deep end of your pool. 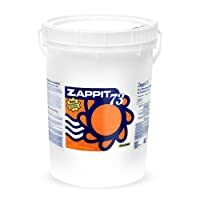 Zapp It comes packed in a bucket and in granular form to ensure that you get an easy time when adding to your pool. Every bucket weighs 50 pounds, which is enough to run for a few months and make sure that your pool remains sanitized. The product boasts of 70% available chlorine, meaning that you can rest assured of getting a shocked pool every time you use it. 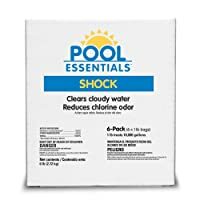 Actually, this is a super chlorinator and pool shock, all in one packet. Fast dissolving granular comes in handy since you can use your pool immediately you shock it. And 1 pound of this product is sufficient for use in a 40K gallon pool. Hence, it is an economical and easy to use shock. The type of pool shock you use will depend on the water chemistry and why you need to shock your pool. For green water, use calcium hypochlorite shocks. For weekly maintenance, use calcium hypochlorite, sodium di-chlor, or potassium mono persulfate shock. From there, know the type of pool before you add your pool shock. Polyvinyl chloride or vinyl is made by merging ethylene and chlorine. It is then rolled into thin, flexible elements that are used to line your pool. Hence, you should use non-chlorine shock in these kinds of pools to prevent bleaching. Use products that have 65% or less chlorine in them. These are molded pieces of fiberglass that are coated with a gel cover. It is not affected by chlorine due to its long-lasting surface. You can use any of the shocks that we have recommended for weekly maintenance. Concrete are often covered with plaster that is strong. Therefore, you can use just about any kind of pool shock for these pools. Q: What does a pool shock do? A: Pool Shocks come in handy to help sanitize your swimming pool. They help to remove algae and bacterial and prevent them from re-growing in your swimming pool. Q: Should I buy liquid or powdered shock? A: For vinyl pools, it is ideal to buy liquid shocks since there is almost a zero chance they will affect the lining. If you get the powdered model, ensure that you mix it with water before you add to your pool. For a concrete pool, you can easily add any type of shock without worrying about anything. But always premix granular or powdered sock with water before you add it to your pool. In conclusion, the best pool shock for your swimming pool should be able to kill algae and bacteria and prevent them from re-developing in the future. Any of the products we have reviewed above will do a great job for your pool.